Is Korea The Future of Specialty Coffee Technology? Home Coffee Consumers Is Korea The Future of Specialty Coffee Technology? Café Show Korea kicks off in just a few days, and so we’ve spoken to some experts on the Korean coffee scene about what you can expect. The answer: not just rapid growth and keen coffee aficionados, but also technology, technology, and more technology. Spanish Version: ¿Es Corea el Futuro de la Tecnología de Café de Especialidad? One of the world’s fastest internet speeds (according to The New York Times). Virtual Tesco shops in subway stations. Hyundai augmented reality apps for car maintenance (think Pokémon Go but the aim is to change your oil, not catch ‘em all). It’s safe to say that South Korea, and especially Seoul, is a tech-loving place. What’s more, between 2007 and 2013 the number of coffee shops in the country grew by 680% (according to The World Coffee Leaders Forum). It should come as no surprise that these two trends are coming together. High-tech coffee machinery isn’t just appealing to die-hard aficionados, either. It’s also a pull for the casual consumer. Take CaFacé, a café that “prints” people’s selfies in colour on their coffees as latte art. Apps: The Near Future of Korea’s Coffee Tech? Behmor has never been shy about using new technologies. 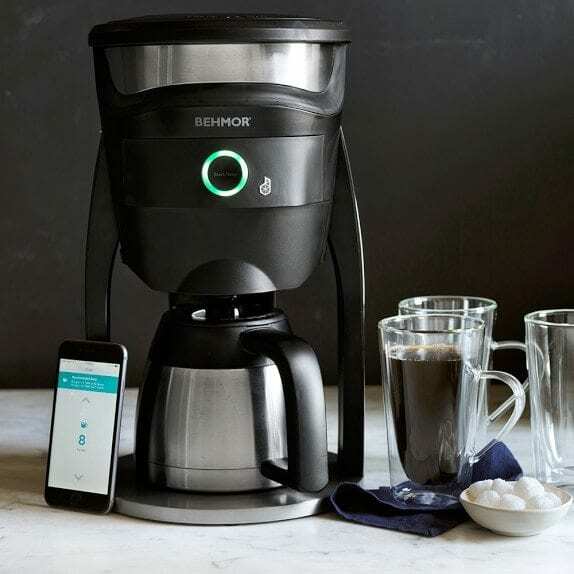 This is the company that has the Connected Brewer, an eight-cup SCAA-certified coffee machine that you can set to automatically make coffee with your smartphone – either now or at a set time. They’ve also signed up with Amazon Dash, so that their home/office coffee machines will automatically re-stock themselves, and Alexa Voice Service, so that in the future users can simply tell their machine what to make. Korea’s already high smartphone penetration is only growing, according to The Wall Street Journal. And Beom informs me that apps such as Cropster are popular. Is app-controlled equipment the next step? Will a Dwindling Human Population Lead to Robots? I ask Beom what “holes” he thinks need to be filled by future technologies. He considers it. While the world’s population increases, South Korea’s is decreasing. According to the Washington Post, the country currently has 50 million residents – yet by 2136, that figure will be 10 million. I ask if a robot can make coffee as well as a human. Korea’s adoption of coffee, and particularly specialty coffee, is young. Yet in a country where coffee is science, and apps can do anything from make your coffee to help you fix your car, perhaps it will be the future of technology in coffee. I wonder how many years it will take before we start to see the first robot specialty barista. It might seem far-fetched, but when a voice-controlled SCAA-certified automatic coffee maker is already on the horizon, are we really that far away from it? Behmor is a sponsor of Perfect Daily Grind. This interview was conducted in accordance with our editorial policies, and Behmor has had no greater influence on the final copy than any of our other interviewees. Perfect Daily Grind is not affiliated with any other individual or body mentioned in this article and cannot directly endorse them. Would You Drink a Jack Daniel’s Tennessee Whiskey Coffee? Do You Know the Truth Behind These 6 Coffee Myths?